The Quanta system is an instrument designed for the accurate detection and rapid counting of particles in solution at very low concentrations, (102 ~ 105 particles/mL for 1 µm diameter beads). The Quanta system is designed to measure individual fluorescent particles; either the particles are intrinsically fluorescent, or they must be tagged using a suitable fluorophore. In both cases, the wavelength of the applied laser light must match the excitation wavelength of the fluorophore in use. 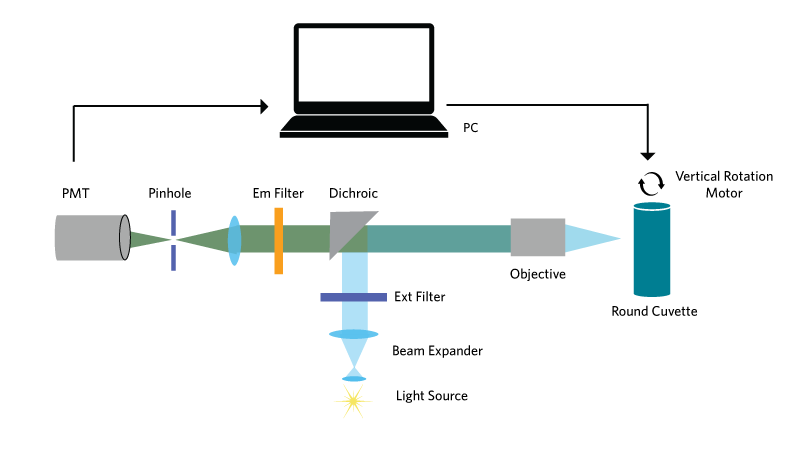 The instrument (see Technical Diagram) uses a low power (a few milliWatts) laser as excitation source; the laser beam travels through a dichroic mirror and it is focused onto the sample by a low magnification and long working-distance, objective (typically 5-8 mm). The fluorescence is collected by the same objective and diverted by the dichroic mirror to the detector (photomultiplier tube). Laser modules are available in a variety of wavelengths covering the range from 375 nm to 635 nm; they are used in combination with the dichroic filter, the proper combination being ultimately dictated by the absorption and emission properties of the fluorophores utilized for the measurements. The excitation laser beam, along with the focusing objective, defines a conical volume in the fluid under examination. The geometric dimensions of the excitation volume are a function of the objective magnification and working distance. 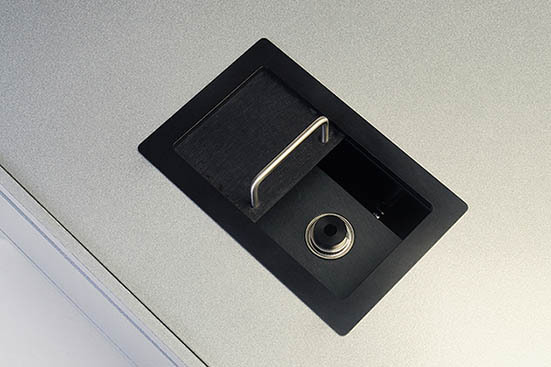 The solution container is a glass vial secured within the sample stage via a tight-fit base and a spring pressured centering cap which is connected to the top of the sample stage. 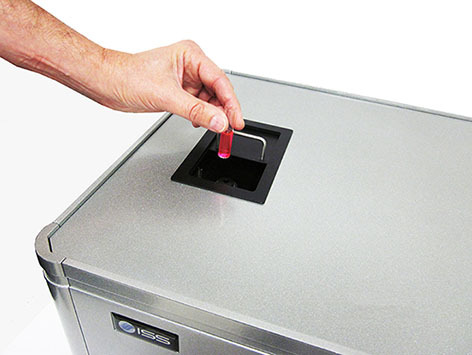 A key feature of the technology is the movement of the sample holder. The vial is placed into a rotating holder; by centrifugal force the particles assemble close to the walls of the vial for facilitating the detection. Moreover, the vial holder can move vertically. Both the rotation and the vertical displacement allow for the laser beam to probe the entire volume of the vial in search of fluorescence particles. Whenever a particle enters in the excitation volume, it absorbs light; the fluorescence is emitted within the time frame of the characteristic decay time of the fluorophore and produces a burst of light. 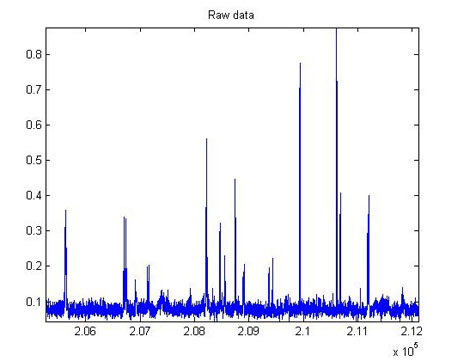 The number of peaks is counted, each peak corresponding to a particle crossing the excitation volume. The pattern recognition (PR) software separates the counts due to the particles from the background noise and allows for a reconstruction of the total number of particles present in the observation volume. Dual channel detection of ultra low concentration of bacteria in real time by scanning FCS. Altamore, I., Lanzano, L., Gratton, E.
Meas Sci Technol. 2013 Jun 1;24(6):65702. Rapid detection of single bacteria in unprocessed blood using Integrated Comprehensive Droplet Digital Detection. Kang, D.K., Ali, M.M., Zhang, K., Huang, S.S., Peterson, E., Digman, M.A., Gratton, E., Zhao, W.
Nat Commun. 2014 Nov 13;5:5427. doi: 10.1038/ncomms6427.